This morning, we woke up to a pretty nice day. We wanted to head up El Capitan Pass and find the caves but the cruising guide said we needed a reservation with the Forrest Service. We had been trying to call them whenever we had a cell signal but couldn’t get an answer. It was 1 hr. each way and, although, it would have been scenic ride, we decided it wasn’t worth it only to get denied access. 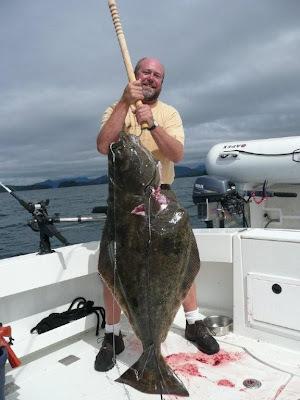 So, we decided to head for Craig and do some Halibut fishing along the way. Val just had to have her Halibut fix…she loves to catch Halibut and has been asking for days to go again. I told her we have to wait until we can get it frozen and shipped home. Our little boat can only handle so many frozen fish and we’re already at capacity. 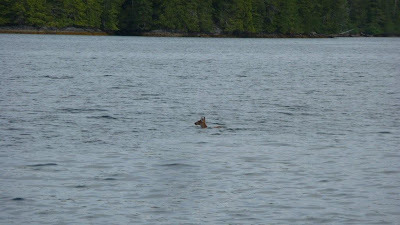 As we cruised out of our little cove, Tanner spotted a deer swimming between islands! We cruised up beside him and got some video and pictures. He was pretty freaked out so we left him on his commute and continued on our way. Half an hour later, we had our anchor set in 150’ and drifted back off the knob to about 300’ of depth. Val and I dropped our Halibut gear. Much to Val’s surprise, I actually caught a fish! Yes, even me! (She got skunked!) Sure enough, within 15 minutes, I was reeling up my catch. It turned out to be 4.5’ long and weighed 73 pounds! The harpoon worked great and it thrashed around beside the boat and splashed us all. We had a good time getting him bled and inside the boat. High fives around! As we were fishing, the whole time, there were half a dozen Orca Whales (Killer Whales) swimming not too far away. Val saw them do a full body breach a couple of times. I was busy cleaning my big Halibut. Catching Halibut is fun but it only took 30 minutes to catch him and land him and 2 hours to clean him, clean the goo off the boat, package him up, and get him in the cooler. That’s big work! (But still fun!) Our boat smells really fishy, for some odd reason!?!? So, Cody and I got out the buckets, soap, brushes, and started cleaning. We opened all the hatches, scrubbed the bilges, and got all the blood, scales, and goo off the boat. Now it only smells moderately fishy! Cruising to Craig, we saw many more Humpback whales, dolphins, seals, and sea otters. The clouds and rain are here again, which I don’t mind…it cleans the salt off the boat. We got to Craig mid-afternoon and took on fuel and water. Val and Cody went to the Laundromat and Connor and kept working on cleaning and organizing the boat. I can tell we’ve been on board for over a month already. Surprisingly, everything is working great, everyone is getting along wonderfully, and we’re all having a great time. This has been the best vacation ever, by far, at least for me. The boat is clean. The laundry is done. The fish are being frozen overnight at the grocery store. (We’ll ship it all home from Ketchikan.) All is well in our world. We hope it is in yours too!